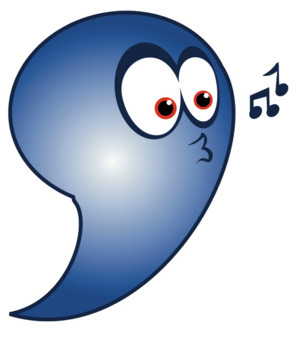 7 great resources for teaching apostrophes and contractions! This bundle includes 2 PowerPoint presentations, 3 games and 2 worksheets! 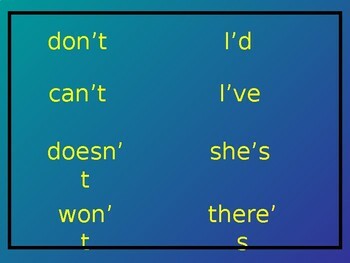 A Great PowerPoint to introduce, explain and show examples of contractions and apostrophes. Over 80 slides!! 9 slides. 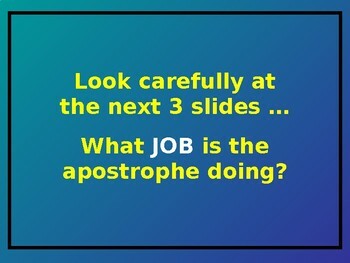 Great to use when introducing APOSTROPHES to the class. Examples given and VERY easy to follow! A 100-piece dominoes game to help teach and reinforce APOSTROPHES. Ideal for 4 players … 25 pieces each. Before a child can place a piece down, they must read the word on their card. 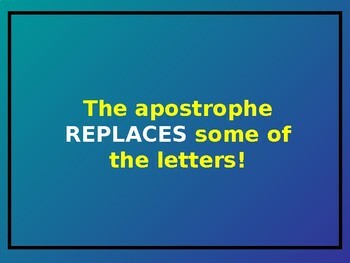 A great APOSTROPHES game for younger learners! Cut out the words. Place them face down on the table and mix them up. Take it in turns to choose two cards. If two cards match, you get to keep the cards and have another go. Keep going until all the cards have gone … then add up your score. Cut out the cards and shuffle them. Place the cards face down and take turns to turn 2 cards over (1 picture card and 1 sentence card). Read the cards aloud. If 2 cards match, you get to keep them. The person with the most pairs at the end WINS! Ideal for younger learners. Activity 1: Examples of contractions plus an activity asking the children to write some sentences using contractions. Activity 2: Students are asked to rewrite some sentences replacing the underlined words with a contraction.